Fourteen-year-old Sara Godfrey lives with her Aunt Willie, older sister, Wanda, and younger brother, Charlie, who has some disabilities resulting from an early childhood illness and does not speak. This summer, Sara is feeling very unsure of herself. She is certain that Wanda is much more beautiful than she is, and therefore much more desirable to boys, and she is concerned that her life may have peaked in third grade. Sara's superficial concerns take a backseat, however, when Charlie wanders off, possibly to see the swans that have recently appeared on the lake, and becomes lost. 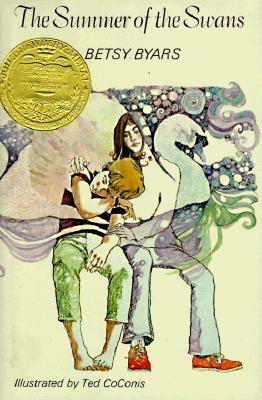 I foolishly avoided this book for years because I had it mixed up in my mind with Lois Lowry's A Summer to Die and assumed it was a story about a child dying of a rare disease. (I can't bring myself to read books about people who are dying, especially children.) It turns out, though, that this book is similar in both style and substance to Betsy Byars's Blossoms series, which I thoroughly enjoyed a few years ago. As in her other books, Byars's writing in The Summer of the Swans is straightforward, but distinctive. The events she describes are mostly mundane, everyday occurrences, but she makes them interesting by introducing compelling characters, believable dialogue, and genuine emotion. Some realistic fiction titles are set in the real world, but include events which are very unlikely to occur in the reader's own life. This book, by contrast, sticks to reality and conveys the truth about families, sibling relationships, and early teenhood. Any young reader can relate to Sara, even if they haven't had her exact experiences, because she comes across as a real person. The preferred terminology surrounding disabilities has changed since the writing of this book, but despite the use of outdated descriptions for Charlie's limitations, there is an understanding throughout the book that "retarded" is a pejorative term not to be used to describe him. If this book were written today, it would probably also include a more specific diagnosis for Charlie, but it didn't bother me that much that he didn't have a label since he and his specific behaviors were described quite clearly. Overall, this is a very sensitive book. It is sensitive to the tumultuous emotions of puberty, to the needs of a young boy with disabilities, and to the ways in which siblings, with and without disabilities, influence, love, and care for each other. Thanks for writing about this. I always conflated this one with A Summer To Die, too, and never read it. Definitely a marketing fail of some sort. Thanks for setting me straight! I read this one years ago when I was a kid. I remember it vaguely but for some reason never felt compelled to pick it up again. Now I think I will. Thanks for the review and for participating with me in Newbery Through the Decades!